I live in the top end of Australia and am consistently amazed by the beautiful colour displays that light up our skies at sunset and sunrise. I love how the details get sucked out of everything, leaving a stunning black sillouette that contrasts deeply against all these wonderful colours. That is what I yearn to capture and never get tired of watching and painting these captivating natural displays. 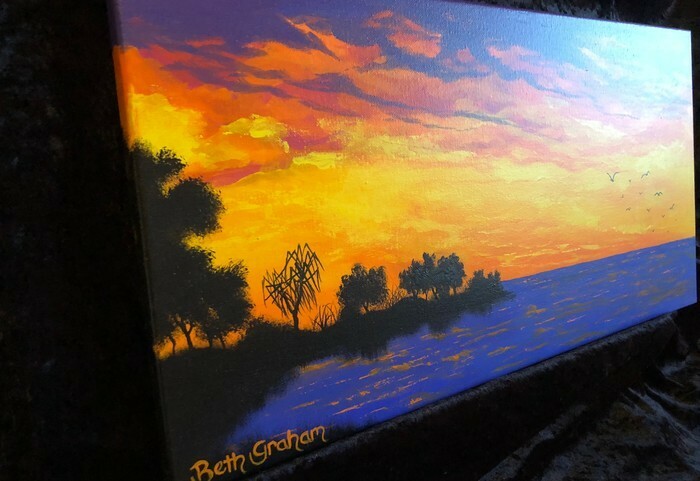 The painting captures a magnificent ocean sunset along some untouched shoreline offering a safe and welcomed place for some of the local birds to roost for the night. Please include your order number or surname in the reference section so I can match your payment with your items!